A few weeks ago, we returned to North Carolina’s Outer Banks for vacation after the boys fell in love with it for the first time and Andrea and I fell in love with it all over again last year. With Andrea spending long stretches of time in Mexico and the stress around the uncertainty and then termination of my job in the last six months, we truly needed this return to the quiet, relaxing beaches of Hatteras Island, together as a family, with no outside stress. One of the highlights from our trip last year was when Benjamin and Andrea made the long hike out to the Cape Point near the Cape Hatteras lighthouse. It is known for all the sea shells that wash up on shore along with the fact that you can wade out into the surf at low tide without being hammered by waves. Without an off-road permit for your car it is a good 30 minute walk to get there from the parking lot. When Andrea and Ben went last year not only did they find some cool shells, but it was a sweet adventure for the two of them. There was a certain magic to it. So much so, that Ben and Andrea really wanted to do it again this year and their excitement was contagious to Matthew and I. We checked the tide charts and decided the best time to go was at 6:00 AM on our last full day there, so we set our alarm for bright and early and off we went. After 25 minutes of walking, we could see the point of the Cape…But we also saw a sign on a post with wire heading in both directions towards other posts…A makeshift barrier. The National Park Service had closed down the cape to everyone…No exceptions, not even for two incredibly disappointed little boys. It was a very quiet walk back to the car, with the silence interrupted occasionally by one of the four of us taking turns wondering out loud why the signs weren’t posted in the parking lot. The boys were being mostly good sports about it, but they were clearly upset. The disappointment hung in the fresh, salty air. When we finally got back to the car, we found a place to grab breakfast. While waiting for our food, using her phone, Andrea tried to find out why the cape was closed. Best she could find was that it was either to protect sea turtle eggs or nesting Piping Plovers. 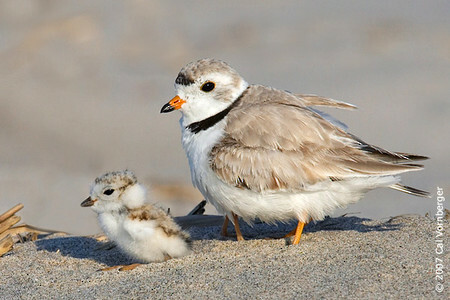 We all love sea turtles, but we had no idea what the hell a Piping Plover is. And so, the Piping Plover instantly took on our wrath! Turns out it is an endangered but ridiculously cute shore bird. The cute little menace looks like it spends its days running along the edge of the water eating whatever sealife comes in with the tide and disappointing families everywhere. Immediately, the jokes began about hunting down the tasty little morsels and how we should be having Piping Plover for breakfast. Suddenly, we had a target for the morning disappointment and the fact that it is so cute just seemed to make our now feigned anger at it even funnier. I’ll never forget how the giggles erupted from around the table when we looked at pictures of this little hell-bird. And just like that, disappointment was turned to laughter and the Piping Plover has become part of our family history. While we had so many great memories, it is the Piping Plover, I think, that we are going to remember the most from this trip. Weeks later now, the very mention of that damn Piping Plover causes Matthew to pretend growl and mumble “I hate that Piping Plover!” Ben will talk about how tasty the little bird must be and we all laugh. Sure, the fire on the beach at dusk and spending a day floating, playing and exploring the sound are wonderful memories. And, it’s not that we are focused on this disappointment. It’s just that we were able to turn the disappointment around and laugh at ourselves and our sorry failed expedition which saw a stupid little bird get the best of us. I think it’s an important life-lesson for the boys. Life is going to be full of disappointments, but how you overcome them are what’s going to bring about life’s sweetest moments. 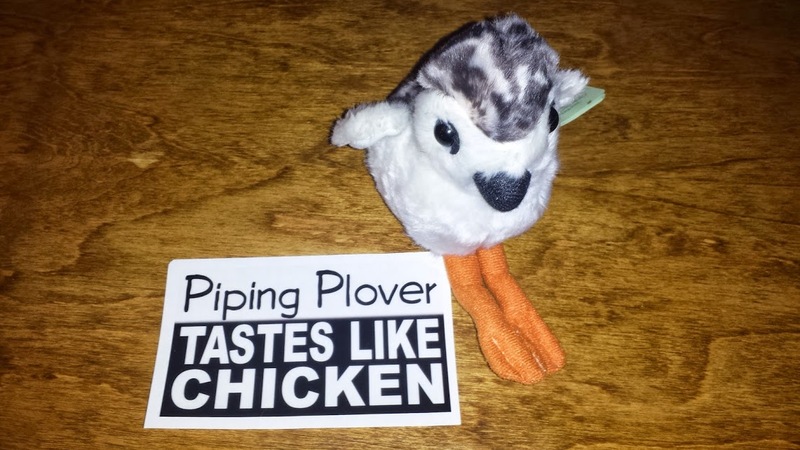 When life gives you Piping Plovers, you make roast Piping Plover with a nice herb and garlic sauce. And, apparently, we aren’t alone. When we got back, I went to Amazon.com to see if they had any stuffed Piping Plovers I could get the boys and I found the bumper stick in the picture above. It seems nobody likes that Piping Plover!